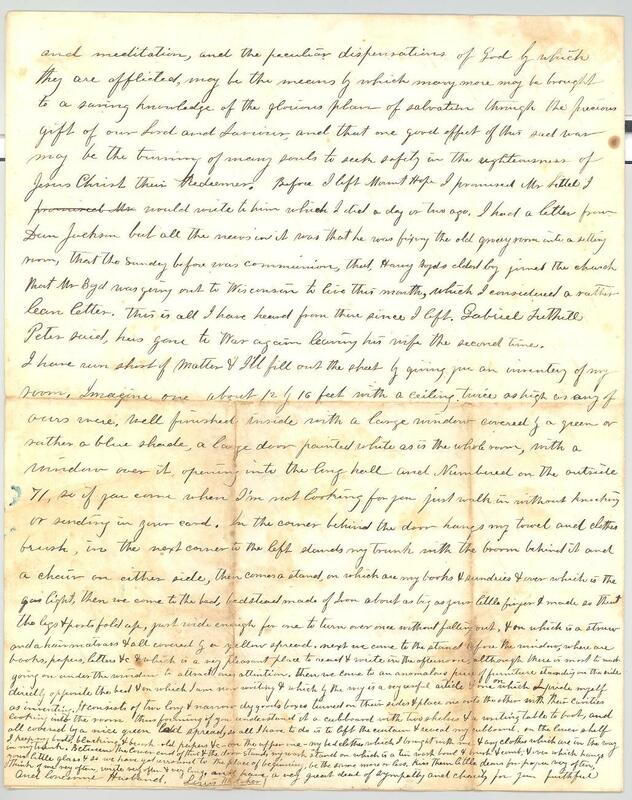 Item description: Letter, 19 September 1862, from Jonathan Lewis Whittaker to his wife Julia A. Wells Whitaker. Jonathan Lewis Whitaker (fl. 1862-1865) was a physician of Orange County, N.Y., who served as a United States Army surgeon during the Civil War. Whitaker served first at a United States military hospital in Chester, Pa., 1862-1863, and later attached to the 26th United States Colored Troops near Beaufort, S.C. Whitaker was married to Julia A. Wells. Item citation: From the Jonathan Lewis Whitaker Papers, #3674-z, Southern Historical Collection, The Wilson Library, University of North Carolina at Chapel Hill. U.S. General Hospital, Chester Delaware Co., Pa. I was very agreeably surprised this morning by receiving your letter before I was looking for it, on Friday instead of Saturday morning, although something seemed to whisper in my ear that I might get a letter from wifey this morning. Of course I shant blame you if I get one every day instead of every week and will take good care to read them through & sit right down and answer them, I feel very grateful to you for your minute description of your breakfast party and for telling me so much about those little gifts which God in his goodness has lent to us. How I like to have you tell me every little thing about them for you know I cant see or hear them for myself, and also every little thing that occurs about the time which you might not think worth mentioning, still it is these little things which make a letter interesting to one who is away from home and those he loves. You never need be afraid of tiring such a person with an account of little things if indeed he has any respect for the home he has left. Matters are progressing very nicely at this place, we are living very easy, patients are getting well very fast. I believe we have not had a death occur here now in about two weeks which is very remarkable considering we have a thousand sick and wounded men. Almost all of them are able to go to the table to eat and every few days we are sending away a lot to return to their regiments in the field. We are expecting a new lot now very soon. O what terrible fighting they are having down in Maryland for the last 5 days and it still goes on killing off human beings by thousands every day and bringing grief & desolation to so many families, to as many fathers & mothers, so many young wives, and fatherless children, God in mercy grant that as this is being the hardest and bloodiest field, that it may also be the last, that our affairs may be so ordered in the wisdom of providence that wars and bloodshed may come to an end. But as His ways are unsearchable and His wisdom past finding out so that we cannot understand why he is so afflicting us as a nation, yet we do believe (as we must if we trust in Him), that he has some wise end in view, something that will eventually prove it to have been for our good and the honor and glory of His great and excellent name. Whatever it may be, may it be the prayer of all good men that it may be speedily accomplished, that we may once more become a united people whose God is the Lord, and blessed with peace and prosperity. We had another nice concert here Tuesday and are going to have another in two weeks again. I suppose you will be down to hear the next one, would you? It would set you forward a week to see the good it does the soldiers, the crippled and infirm and sick, some on crutches, some with canes, some with heads bound up in muslin, some with arms in slings and splints and every other way all crowding in & densly filling the room, with windows & doors full outside, and cheering and stomping whenever any thing pleases them particularly. There are two things the soldiers here would never get tired of, singing good songs – and cheering for Gen. McClellan, they all seem to idolize him and are ready to fight any body that says any thing against him. The sun is pouring down very hot here to day. I think it is the hottest day we have in three or four weeks. I will have to stop here to go to my dinner, after which I will spin you out a little more if I dont eat too much & forget you over a good dinner, and if you are tired reading my scribling this is a good place for you to stop and take a nap before you go farther, taking care that you dont forget all about it, and leave the rest without reading. — — — — Dinner finished and patients seen too I can now go on with my letter. Six [?] 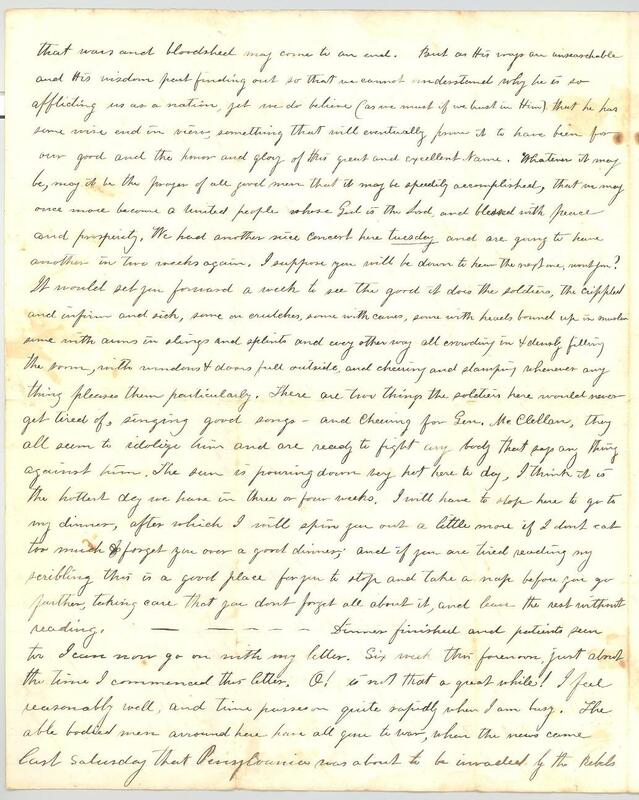 this forenoon, just about the time I commenced this letter. O! is not that a great while! I feel reasonably well, and time passes on quite rapidly when I am busy. The able bodied men around here have all gone to war, when the news came last saturday that Pennsylvania was about to be invaded by the Rebels every man strapped on his knapsack and musket and started for Harrisburgh, young & old, sick and poor, stores closed & business stopped Special sermons were preached on sunday night to the militia in all the churches and they were all densely crowded. I attended the Presbyterian Church which is large and I could hardly get a seat. The sermon was for the war and especially to those who were going to start the next day. I was from “Put on the whole armour of God.” I saw the men go away the next morning and a tremendous crowd there was to see them start, a great deal of wiping of eyes and blowing of nose. I received a letter from Dr. Mills last week. He has a situation on an island in New York Harbour, and from what he says must have a great deal more to do than I have, and can not live so comfortable, most of the patients there are in tents. I don’t believe there is a Hospital in the United States where the patients are more comfortable and better attended too, with a better situation than this one. Dr. Mills’ family lives where they did and I suppose he gets to see them every day or two, which is very nice, at least it is natural for me to think so who am denied all such privileges. I cant get away from here Sunday morning in time for Church, but I can tend the Episcopal services here in the afternoon and the Presbyterian Church in the evening down to the village, and we have prayer meeting here every Thursday night, beside the Chaplain usually has short services in some one of the wards every day or two, reading a chapter, praying, singing and saying a few words. Religious tracts and books are freely distributed to the soldiers, texts of scripture neatly printed on binders board are posted up all over the Hospital so that those who can not move can read & reflect in the silence of their own minds. There are a goodly number of true Christians among them, and God grant that the instruction they here receive, the advantages of their whole time for reading and meditation, and the peculiar dispensations of God by which they are afflicted, may be the means by which many more may be brought to a saving knowledge of the glorious plan of salvation through the precious gift of our Lord and Saviour, and that one good effect of this sad war may be the turning of many souls to seek safety in the righteousness of Jesus Christ their Redeemer. Before I left Mount Hope I promised Mr. [Sittel?] I would write him which I did a day or two ago. 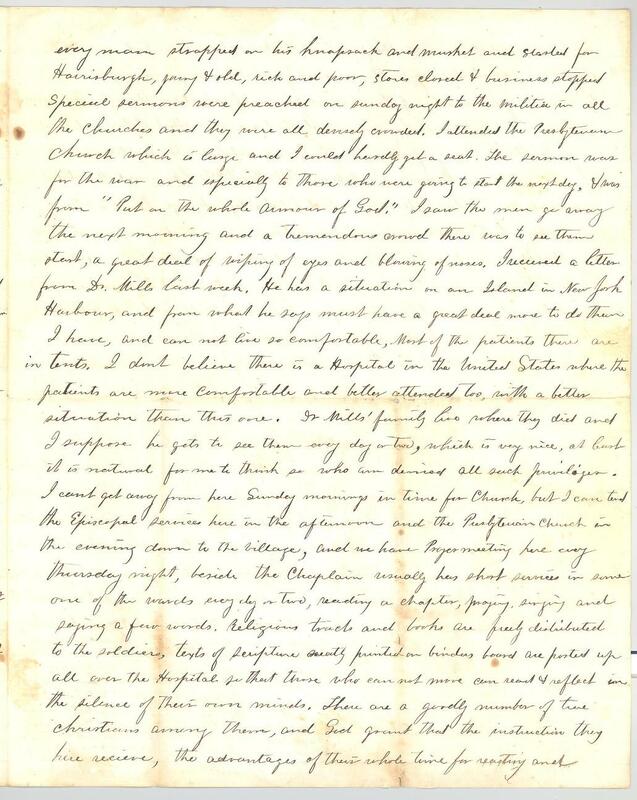 I had a letter from Dan Jackson but all the news in it was that he was fixing the old grocery room into a sitting room, that the Sunday before was communion, that, Harry Boyds oldest boy joined the church, that Mr. Boyd was going out to Wisconsin to live this month, which I considered a rather lean letter. This is all I have heard from there since I left. Gabriel [Tuthill? ], Peter said, has gone to war again leaving his wife the second time. I have run short of matter & I’ll fill out the sheet by giving you an inventory of my room. Imagine one about 12 by 16 feet with a ceiling, twice as high as any of ours were, well furnished inside with a large window covered by a green or blue shade, a large door painted white as is the whole room, with a window over it, opening into the large hall and numbered on the outside 71, so if you come when I’m not looking for you just walk in without knocking or sending in your card. In the corner behind the door hangs my towel and clothes brush, in the next corner to the left stands my trunk with the broom behind it and a chair on either side, then comes a stand, on which are my books & sundries & over which is the gas light, then we come to the bed, bedstead made of iron about as big as your little finger & made so that the legs & posts fold up, just wide enough for me to turn over once without falling out, & on which a straw and a hair matrass & all covered by a yellow spread, next we come to the stand before the window, where are books, papers, letters &c & which is a very pleasant place to read & write in the afternoon, although there is [?] going on under the window to attract ones attention. Then we come to an anomalous piece of furniture standing on the side directly opposite the bed & on which I am now writing & which by the way is a very useful article, one on which I pride myself as inventing. It consists of two long & narrow dry goods boxes turned on their sides & place one onto the other with their cavities looking into the room, thus forming if you understand it a cupboard with two shelves & a writing table to boot, and all covered by a nice green [?] spread, as all I have to do is to lift the curtain & reveal my cupboard, on the lower shelf I keep my boots, blacking & brush, old papers &c – on the upper one – my bed clothes which I brought with me & any clothes which are in the way in my trunk. Between the lower end of this & the door stands my wash stand on which is a tin wash bowl & brush & comb & over which hangs your little glass & so we have got arround to the place of beginning, be the same more or less. Kiss them little dears for papa very often, think of me often, write very often & very long, and have a very great deal of sympathy and charity for your faithful and lonesome husband. 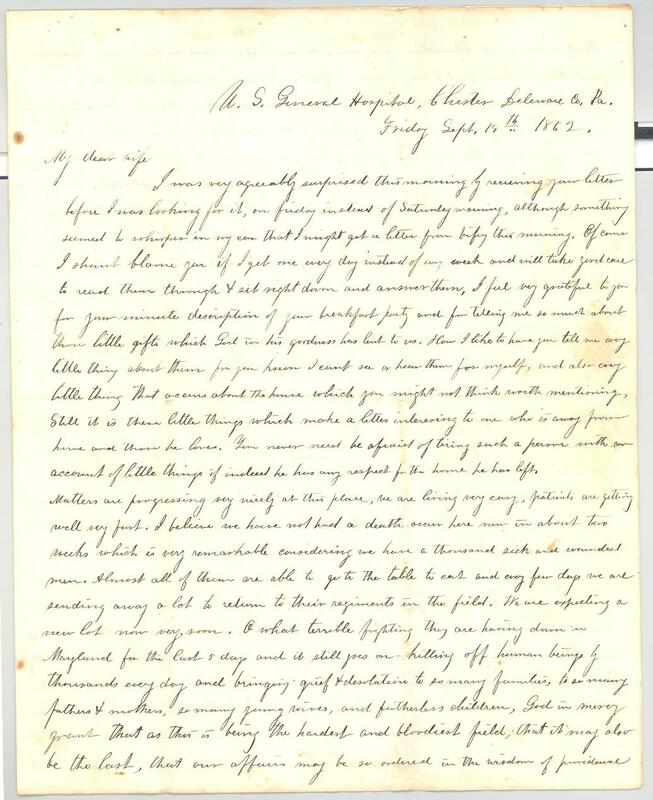 This entry was posted in Southern Historical Collection and tagged Battle of Antietam, Battle of Sharpsburg, hospitals, Jonathan Lewis Whittaker, Julia A. Wells Whittaker, Maryland, Maryland Campaign, New York, Pennsylvania, surgeons. Bookmark the permalink.